Among the treasures I found at Mia's Books & Misc. 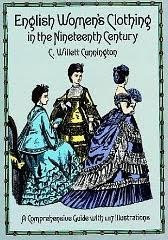 this spring was a reference book titled English Women's Clothing in the 19th Century by C. Willett Cunnington, an unabridged republication of a 1937 book published in London with the same title. The original had some color plates which were printed in black and white in this edition. 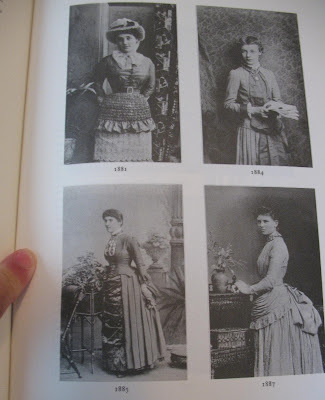 For students of style, historians and genealogists alike, this book provides a seemingly comprehensive collection of clothing, hat, hair and shoe styles with dates of popularity. Real-life photographs are amply supplemented by line drawings and etchings to illustrate variations on the point. Give Martha at Mia's Books a call at 614-838-1280 and tell her DearMYRTLE sent ya!